Sierra Nevada Corporation (SNC) Space Systems' Dream Chaser flight vehicle is lifted by an Erickson Air-Crane helicopter near the Rocky Mountain Metropolitan Airport in Jefferson County, Colo., on May 29, during a captive-carry test. A private space plane is slated to fly on its own for the first time in the next six to eight weeks, a key drop-test milestone in the vehicle's quest to fly astronauts on roundtrip space missions. The Dream Chaser spacecraft, built by aerospace firm Sierra Nevada Corp., will be released by a carrier helicopter at an altitude of 12,000 feet (3,657 meters) or so, then fly back and land autonomously on a runway at NASA's Dryden Flight Research Center in California. The unmanned 30-second drop test will kick off a series of trials that culminate in trips to low-Earth orbit and back, potentially paving the way for contracted, crew-carrying flights to the International Space Station for NASA, company officials said during a press conference today (Jan. 30). Colorado-based Sierra Nevada is one of several spaceship-building companies to receive funding from NASA's commercial crew program, which is encouraging private American vehicles to fill the void left by the space shuttle fleet's retirement in 2011. In its latest round of awards, NASA granted funding to Sierra Nevada for the Dream Chaser and to SpaceX and Boeing, which are working on capsules called Dragon and the CST-100, respectively. The Dream Chaser space plane is the only non-capsule design being developed by a major contender. The space agency hopes at least one of these vehicles is ready to fly astronauts to and from the space station by 2017. Until such homegrown private spaceships come online, NASA and the nation are dependent on Russian Soyuz spacecraft to provide this orbital taxi service. The newly announced drop test is a step along the path to orbit. It will mark the first time the Dream Chaser has ever flown solo, though the space plane did take to the skies last year in a captive-carry test, during which it was held aloft the entire time by a heavy-duty helicopter. 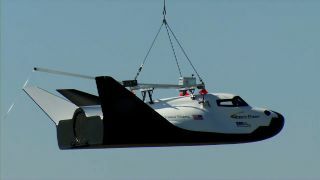 The Dream Chaser drop-test vehicle is currently at a facility in Colorado, but it will be moved to Dryden in about two weeks, officials said. The first flight test should come four to six weeks after that, with two to five more flights following to gather additional data about the vehicle's in-air performance. "The first flight test is just to make sure it will fly, everything works properly, we land on the runway safely," said Sierra Nevada's Jim Voss, head of the Dream Chaser program and a former space shuttle astronaut. "We'll put in maneuvers on the following tests that will gather the coefficients that we need to properly define the aerodynamic characteristics of the vehicle." If everything goes well with the upcoming series of tests, Sierra Nevada will conduct more extensive flight trials with another Dream Chaser vehicle, officials said. "It will be similar to this vehicle, but we'll be able to pilot it with a test pilot on board, and then that same vehicle will be ultimately used for an orbital flight to demonstrate the capability of the Dream Chaser in orbit," Voss said. Aerospace giant Lockheed Martin will help build that more advanced flight-test vehicle, as part of an extensive partnership with Sierra Nevada that the companies just announced today. "They're building the structure for that vehicle, as we finish the design of some of the other systems we'll use for that additional flight test that we'll do in about a year to 18 months," Voss said.